“New medical research into the process of facial flushing and redness has found that individuals with rosacea produce greater nerve, blood flow and sweating responses than people without the disorder when exposed to increased heat or stress. Results of the National Rosacea Society-funded study also uncovered a role for the sympathetic nervous system, which controls the “fight or flight” response and other key involuntary functions such as heart rate, digestion, breathing and perspiration. To increase body temperature, the researchers had 10 rosacea patients and 10 healthy control individuals wear a tight-fitting suit lined with tubes carrying water heated to 115°F until their body temperature increased by approximately 2°F. Each person was then precisely measured for supraorbital nerve activity (a nerve just above the eyebrow that serves the forehead skin), forehead skin blood flow and forehead sweat rate. Results: The researchers found that rosacea patients had higher skin blood flow and sweating rates compared to normal subjects both before and after the heating began, and their skin blood flow and sweating also began to increase more rapidly during heating. In a separate part of the study, heart rate, supraobital nerve activity and blood pressure were monitored in 12 rosacea patients and 12 healthy control subjects during mental and physical tasks. These included performing fast-paced mental subtraction exercises for two minutes, using hand gestures to indicate answers, and tightly squeezing a handgrip for two minutes. I n the illustration on the right you can view the relationship between the sympathetic nerves of the facial skin, the nerve endings, the blood vessels and the sympathetic nerve-induced flushing response. 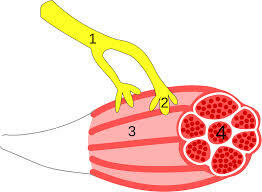 More specifically, if you follow the numbers you can see the anatomy and location of the sympathetic nerve fiber in yellow (#1), the nerve ending that innervates facial blood vessels and is responsible for releasing dilator neurotransmitters onto the blood vessel below (#2), the blood vessel dilating (expanding) in response to overactive sympathetic nerve activity (#3,) and the flushing response depicted by the large numbers of red blood cell clusters inside the blood vessel wall (#4). For the last two decades many physicians and medical researchers have hypothesized that “overactive” or “abnormal” sympathetic nerve activity played a major role in rosacea flushing and facial redness. High environmental temperatures, high internal body heat, stress, emotions and mental calculations (i.e. arithmetic) have been shown to increase blood flow to the cheeks, nose and forehead of rosacea facial skin in isolated experiments. 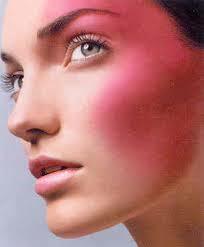 All of these are major triggers for rosacea sufferers. The one perplexing trigger, mental calculations, was actually researched and published by Dr. Peter Drummond of Australia over a decade ago. These results go a long way towards explaining a perplexing form of flushing and facial redness — rosacea sufferers and their physicians were at a loss as to why they often flushed while taking exams in high school and college and why the flushing response was so intense in rosacea sufferers and non-existent in those students without rosacea. Sadly, over the years, considerable feedback indicates that many rosacea sufferers dropped out of college or higher education because they could not concentrate during exams due to extreme flushing, burning sensations and long-standing redness within 15 to 20 minutes of taking any form of test. As the research above demonstrates, even “fast-paced mental subtraction exercises for two minutes… caused increased facial blood flow and flushing responses”. The Rosadyn+ team performed over four years of research developing the popular Rosadyn+ nutraceutical in an effort to treat rosacea symptoms and triggers. One of the main dysfunctions that two of the Rosadyn+ doctors found was a clear abnormality of sympathetic nerve activity in rosacea sufferers or those prone to facial redness and blushing. Oddly enough, most of these studies were not performed by rosacea specialists, rosacea physicians or other medical specialists in the field, but were discovered by Neurologists, Endocrinologists, and Anatomy Specialists by accident. Just like the recent National Rosacea Society research demonstrates, these earlier studies indicated that increased external heat, increased internal body heat, emotions and mental calculations played a key role in blood vessel dilation and flushing responses — yet, this was never published to the rosacea community for decades — so, it was largely unknown to rosacea sufferers and treating physicians. So, when developing Rosadyn+ a natural Rosacea treatment support nutriceutical, a key component was to help target this dysfunction head on and developed a synergistic combination of two very effective, pharmaceutical-grade nutraceuticals that reduces overactive sympathetic nerve activity and greatly reduces the flushing, redness and burning sensations associated with these strong sympathetic nerve-induced rosacea triggers. See why PharmaGaba, L-Theanine along with Enzyme Co-Factors and Phospholipids are Incorporated Into Rosadyn+ Learn how they work together to help to address sympathetic nerve response rosacea flare triggers. GABA (gamma-aminobutyric acid) is the primary natural calming neurotransmitter in the brain. In fact, it is one of the brain’s most important regulators of proper sympathetic nerve activity and function. It appears that many people with “overactive sympathetic nerve activity” and other brain disorders do not manufacture sufficient levels of GABA — which is used to calm down sympathetic nerve activity and keep it in check. GABA, in the right form, is completely safe and remarkably effective without side effects.If you visit your local health store or do a search on the internet you will find over 60 brands of SYNTHETIC GABA. Studies with synthetic GABA have shown that it is not clinically effective — even though it’s in most supplements, it is completely worthless. Simply put, synthetic GABA is too large to pass through the blood brain barrier so the brain does not receive this important supplement. Other studies indicate that even if a very small percentage of synthetic GABA passes into the brain it is not able to bind to receptor sites like natural GABA due to minor differences in shape. The ONLY clinically proven form of GABA is a natural form known as PharmaGABA™. This specialized form of natural GABA is extremely expensive, but Rosadyn only wanted to incorporate a clinically-proven form of GABA to help normalize overactive sympathetic nerve activity in rosacea sufferers. Where does PharmaGABA come from? It is produced with the help of a bacteria, Lactobacillus hilgardii, that is also used to ferment vegetables in the preparation of the traditional Korean dish known as kimchi. The bacteria is fed a nutrient-rich broth to produce the PharmaGABA™ and it is then filtered out and concentrated. PharmaGABA has been shown to dramatically decrease overactive sympathetic nerve activity. In fact, in clinical studies, EKG’s (which measure various brain waves and nerve activity) were placed on human subjects and 45 to 60 minutes after ingestion of PharmaGABA the EKG’s measured a significant increase the production of alpha brain waves (the “calming” brain waves that reduce abnormal sympathetic nerve activity, anxiety and stress — increasing relaxation — but without any drowsiness.) In fact, while PharmaGABA reduced sympathetic nerve activity, anxiety and stress, it simultaneously increased mental focus and mental alertness. It is important to emphasize that PharmaGABA also reduced beta-waves in the brain which are responsible for increased stress, anxiety and the “fight or flight” sympathetic nerve activity. So, this specialized nutraceutical worked quickly and effectively on BOTH alpha brain waves (by increasing calming brain waves — sympathetic relaxants) and beta brain waves (by decreasing stress-inducing brain waves — sympathetic stimulants) to normalize overactive sympathetic nerve activity via a two-pronged approach. We cannot overstress the fact that while PharmaGABA is extremely expensive, it is the only form of GABA that works in the human brain and has been proven to be highly effective and extremely safe at any dose. Rosadyn purchases PharmaGABA in bulk so we receive exceptional savings on this product and we pass these savings down to our customers so it is affordable. We don’t know why countless other manufacturer’s still use synthetic GABA because it has no physiological action in the human brain and does not treat overactive sympathetic nerve activity in rosacea sufferers. Please don’t waste your money on any other form of GABA except PharmaGABA…. it’s that important! Pharmaceutical-grade L-Theanine™ is clinically proven to reduce overactive sympathetic nerve activity — along with stress and anxiety — in a synergistic fashion with PharmaGABA™. It is the perfect compliment to PharmaGABA and works synergistically to naturally increase the brain’s production of natural bio-active GABA and it sensitizes GABA receptors in the brain which makes GABA significantly stronger and more effective… without drowsiness. There are countless forms of L-Theanine on the market, but there is only one pharmaceutical-grade L-Theanine™ (Suntheanine™) that is the only form clinically proven to work and is backed by dozens of human clinical studies for efficacy and safety. This specialized form of L-Theanine™ is extracted from Japanese Green Tea Leaves and the active molecules are isolated and concentrated 100-fold naturally through complex processing where it enters the brain — greatly increasing and enhancing natural bio-active brain-derived GABA. This directly relaxes the overactive sympathetic nerve activity located in the hypothalamus — a key area in the center of the brain responsible for sympathetic nerve fight or flight responses, flushing to heat, blushing to embarrassment, chronic facial redness from internal body temperature fluctuations, etc. L-Theanine and PharmaGABA work synergistically to reduce these major rosacea triggers. bouts of flushing, blushing and rosacea flares. These two ingredients are key to pro-actively treating major rosacea triggers and symptoms. It is ironic that there is no prescription medication equivalent to specialized pharmaceutical-grade L-theanine™ or PharmaGABA™. This is one of the primary reasons why Rosadyn and our new Rosadyn+ have been so effective on hundreds of rosacea sufferers over the last 8 years. Rosadyn+ keeps up-to-date on the latest advancements in nutraceuticals for rosacea treatment and important co-factors and phospholipids that enhance the delivery of each nutraceutical and the bio-activity and effectiveness once each nutraceutical arrives at its destination.With regards to PharmaGABA™ and Pharmaceutical-Grade L-Theanine™, our research indicated that incorporation of three key proprietary enzyme co-factors and proprietary phospholipids improved delivery of both nutraceuticals to the brain by over 200% and increased the bio-activity of both ingredients once inside the brain cells by more than 100%. This proprietary combination of four ingredients increased the overall efficacy of PharmaGABA and L-Theanine by approximately 300%, ensuring the proper treatment of overactive sympathetic nerve activity and its deleterious actions on rosacea symptoms and triggers. If we had to increase PharmaGABA and L-Theanine by 300% physically (i.e. without these proprietary enzyme co-factors and phospholipids) our Rosadyn product would be unaffordable to most customers.So, buying two very expensive — but extremely important — nutraceuticals like PharmaGABA and L-Theanine in bulk and adding selective co-factors and phospholipids that increases their efficacy by approximately 300% each customer is getting the best product at unheard of discounts. Rosadyn+ incorporates two of the safest and most potent nerve calming nutraceuticals discovered to date. PharmaGABA and L-Theanine are supported by countless clinical studies and used by many Neurologists and Naturopathic Physicians for sympathetic nerve dysfunction. But, only these two specific pharmaceutical grade nutraceuticals work in the human body, so don’t waste your money on the synthetic brands. The cofactors and phospholipids incorporated into Rosadyn+ put this product in its own class because they can increase bioavailability by up to 300%. Every rosacea sufferer is unique. Many respond well to the regular-strength clinical dose (one capsule twice a day). However, if you are a moderate-to-severe rosacea sufferer, 8 years of customer feedback and two large pilot studies have shown that some may require larger doses such as double-strength (two capsules twice a day) until the GABA levels in the brain are normal and the sympathetic nerve overdrive has abated. Just like any treatment, it must be tailored to the individual patient and matched to the degree of flushing intensity and duration as well as patience and time. Time? 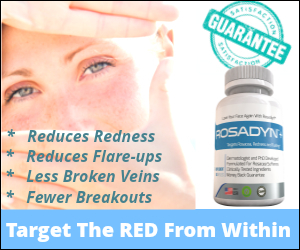 Yes, Rosadyn+ is not a quick fix to years of rosacea dysfunction and damages. Think of it this way; If you need to loose 20 pounds would one trip to the gym do it, one day of eating lite or a single weight loss supplement, shake do it? No! Rosadyn+ is working to help you and your body from the inside out, this takes time for your body to respond. Like weight gain is gradual, your rosacea symptom improvements are gradual and cumulative over time. Depending on the stage of rosacea you are in some begin to see a difference at 60 -90 days while more advanced stage rosacea sufferers may need the full 6 months. Understanding this, this is the reason why Rosadyn+ offers a 6 month money back guarantee!